There are different categories of exporters like Merchant exporters, Manufacturer exporters, Service exporters, Project exporters, Deemed exporters etc. "Merchant Exporter" means a person engaged in trading activity and exporting or intending to export goods .Merchant exporter procures the material from a manufacturer and exports in his firm’s name. Here merchant exporter procures the order from international market. Merchant exporter does not have own manufacturing unit or processing factory. Merchant Exporter can export the excisable goods either directly from the premises of the manufacturer, with or without sealing of the export consignments, or through his premises under claim for rebate or under bond. "Manufacturer Exporter" means a person who manufactures goods and exports or intends to export such goods. The manufacturer exporter procures and process raw materials at his factory and exports finished products. Here, the manufacturer exporter procures the export order and exports in their own name. Is 'service treated as exports'?. What is Service exports: If an exports through a merchant exporter or manufacturer export, we can see the export product tangibly. But there are many servicing industry where we can not see the product physically, but helps to earn foreign exchange. A best example of service exporter is those who export software. Here while selling software to other countries, our country earn foreign exchange. Tourism, Software, Health Care, Consultancy, Hotels, etc. are other examples for service exports. Who are Project Exporters: There are many professional companies undertake contracts for Designing, manufacturing, supply, erection, commissioning, etc. When they earn foreign currency on their sale, they falls under Project exporters and eligible of all assistance and support as project exports. In deemed exports, goods supplied do not move out of country, and payment for such supplies is received either in Indian Rupees or in free foreign exchange. You may have a doubt now that if the goods are not crossing the border of country, how can we treat as an exports?. In deemed exports, some of the other way the transaction boost to earn foreign exchange . Deemed exporters are also eligible government assistance within the parameters of earning foreign exchange. The above are as per India Government. What categories of exporters in your country. Comment. rajat arora: On 20 September 2014 i am a manufacturer exporter , one third party exporter wants me to deleiver the goods at france and wants to pay me in indian rupee. , in which category i will be , how is this possible to arrange deleivery if thid party exporter wants me to deleiver the goods at france. rajat arora: On 20 September 2014 can a manufacturer exporter export on behalf of merchant exporter , i mean can manufacturer exporter arrange deleivery outside of india for the merchant exporter(indian) and at the same time can he accept payment in india ruppee. Sudip Bhattacharya: On 10 January 2015 Respected sir/mam i am a merchant exporter, i want to know that how can i get marketing support from export promotion council in garments and ladies ware. They are providing marketing support on manufacture not to merchant exporter. Louis Fernandes : On 11 February 2015 thank you for your wonderful blog. It's like a bible for the beginners. although, you had given all relevant information on how to apply IEC, I greatly appreciate if you could clarify following 2 quarries for which I could not find any answers in your blog. 1) presently i do not have registered any company on my name. Is it possible to get IEC on my name without registered a company ? 2) Can a company having IEC with Registered Office at Mangalore or Udupi, import / export goods from Mundra Port in Gujarat ? Assuming that the company has no presence of business at Gujarat. Can the company show the address as Mangalore / Udupi? Whether the company shall be required to take branch registered under IEC for importing/exporting goods from Gujarat ? I'm an NRI from Mangalore currently in Saudi Arabia working for a shipping industry. (I have experience in shipping / freight for more than 20 years). I intended to start a business of exporting of Basmati Rice, spices, food stuffs to Gulf region and import some items from china. Admin: On 12 February 2015 Hi Louis Fernandes, You can register as Sole Proprietor ship for forming a firm as your own. If you have an IEC, you can export or import from all ports subjected to the nature of goods by obtaining necessary specific import license/export license if required. Admin: On 14 February 2015 Hello Praveen, You may collect latest procedures of Advance License from Director General of Foreign Trade DGFT near your place and consult with customs authorities about port registration. Chirag Rank: On 17 February 2015 First of all i would thank you for the immense help i have received from your website. Its full of valuable contents compiled at one place. Though most of all my doubts have been cleared through articles beautifully written by you. But still i am left with a confusion regarding the documents to be submitted while opening a current account needed for IEC license. My case is as follows -I want to start a Merchant Exporter Proprietorship firm. As the business firm is still in the initial stage, i want to operate it from my home rather than any commercial space. i contacted a few banks and consultancy firms for the guidance regarding the necessary registration documents needed( In short Under which Category should I get my business firm Registered?). I got two types of advises for registraion-1) ssi(small scale industries) registration. 2) Shop and Establishment license. I don't know which one to choose. Admin: On 17 February 2015 Hi Chirag Rank, As per my experience, Shop and Establishment license is easier to get than SSI. Anand: On 02 April 2015 I ask my foreign country supplier to supply the material to my customer in another country. I receive proof of export to customer . i receive invoice from supplier in my name and I have to make invoice to my customer . what should be the value addition required as per our FEMA Rules. This is nothing but Merchant Trading. Somu Raghav : On 02 July 2015 For the long time i think that do a buisness. Now i am select the export buisness by part time .Once i will get the consistency profit through this business, i will left my current job.But i will try to do the both. I want to play the role of Merchant Exporter. I don't know that from where i have start.My queries are below 1) As a merchant exporter,first i have to select my product (or) select the buyer? 2)How to identify the buyer? 3)How to identify the supplier? 4)Basically which type of product have to selct for more profit with low risk? 5)From starting to start the exports business , i need guidance from you. suchita: On 08 July 2015 I have read your article on rewards for earning foreign exchange. I am a sole proprietor of a company involved in sending healthcare professionals to USA. We are the staffing company earning foreign exchage for the country. For example I earned about $ 30000 last year and hope to earn similar amount this year. BASAVARAJ N C : On 10 July 2015 Is it Merchant exporter required to registered under Central Excies ? IF Not means Please share under which section it is mentioned . Sailajananda Jana: On 20 September 2015 We are a new export house and got IE code for doing IE business. We identified supplier for Parboiled Rice for export. However we are acting as middlemen in this export activity. The exporter is asking us to source the item and complete FOB Port delivery by raising invoice in his name.Therefore there are involvement of two invoices as buy and sell. We have following quires - 1. Would we be treated as deemed export in this transaction. 2. What types of tax implication we need to follow. We are based out at West Bengal and sourcing and export activities would be at Gujarat state. Is there any VAT/CST issue will come. We do not have any registration of sales tax. 3. Is there any eligibility of export credit benefit. Kindly guide us. Samuel: On 22 September 2015 I have formed a Private Ltd company with following in MOA. 1. To carry on the business of Engineering Consultancy Services in India, Middle East and other foreign countries. 2. To carry on business of distributing, retailing engineering products and spare parts for machinery and also to import and export and trade in any of engineering products, machinery and spare parts of machinery. Now I am applying for IEC and I want to get, "Merchant Exporter" code. If I get as, "Service Exporter", can I do both Service and Merchant Exporter as my company MOA says both? vinoth k : On 16 October 2015 Dear Sir, a company which provides only freight forwarding and relocation services globally for it's clients, but has IE Certificate under the category of MANUFACTURING EXPORTER. Is it Legally correct and there will be any penalty or anything if the certificate should have been obtained as a SERVICE EXPORTER. Kindly Clarify. Thanks in advance. Sonal: On 28 January 2016 Hi Sir, I live in UAE and I wish to start my own business dealing with raw foodstuff and spices etc to the UAE market. I have a registered firm in MUMBAI. I would like to trade foodstuff from India to UAE. I need to make an IE Certificate under the category of MERCHANT EXPORTER ? How do I go about this procedure? How long does this process take? Please reply asap. Dishant tibrewal: On 15 February 2016 Hey, i am a class 12 student right now but i seriously want to persue my career as a merchant exporter. I am very much interested in doing export business as this will open me up to the international market and help me and my country earn some foriegn exchange. My queries are. 1) when can/should i start? 2) what are the graduation courses i can do for learning exporting skills? 3) what will be my minimum capital requirement? 4) what is the minimum % margin a merchant exporter has? Nitin Malhotra: On 18 April 2016 Sir i have a doubt regarding future prospect of exporters.Because i read in many articles that from last year export from India is falling down in every sector So, i need your advice for new exporters specially Merchant Exporters.Do they take entry in the trade?Is this the right time?Is the business profitable? Ravin Dhankecha : On 10 August 2016 This is Ravin from Sachin, Surat. working in Export firm company located in Surat Special Economic zone as custom Executive. 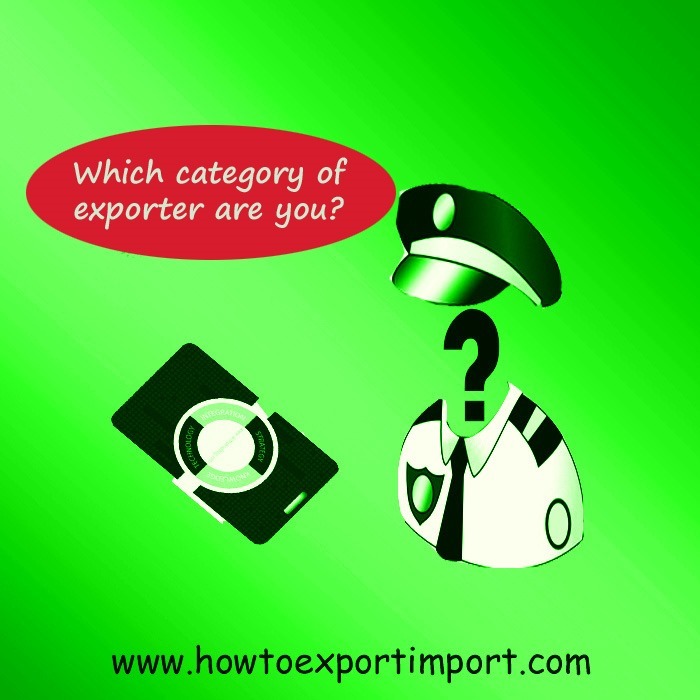 I have referred your website howtoexportimport.com and it's very nice and very useful for newcomers who want to start export import business. now I am planning to start an own business but I need our help and that is HOW TO "SELECT PRODUCT FOR EXPORT". please guide us or share important document or web link where can I find useful data. Piyush Chorghe : On 16 August 2016 I am from Mumbai, I read your blog how to start export import business it is good knowledge for feature exporter those who start export business sir, I registered import export code but how to find products for export I want to start merchant export bussiness, please sir help me to find export product & which product best for export from India like. Handicraft, engenring, lether. mani shankar : On 17 August 2016 i want to register my company in SSI...i am merchant exporter. but there is no option for export. i had searched in service category don't have any option for exporters. which one i have to select sir? and also ask machine power details in that application what can i do sir? please help me sir. shashi bhushan: On 08 December 2016 I am merchant exporter and want to export a material from china to africa so for this could i need some specified types of export code in my old Iec Certificate. Siddhant Jain : On 13 June 2017 I'd like to convey my sincerest thanks for all the content and articles you have put up on howtoexportimport.com! Your website has greatly helped me in understanding the working of international trade and related topics such as finance, documentation, logistics, etc. I was hoping you could guide me on the necessary tax registrations necessary for merchant exporters (Pvt Ltd company) in India as I could not find much relevant information regarding the same.